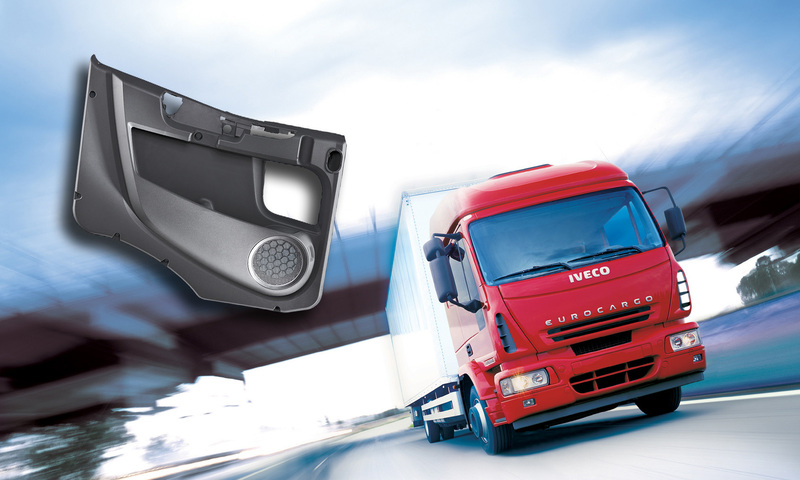 ROTTERDAM, Netherlands, July 31 /PRNewswire/ -- LyondellBasell Industries' Softell polypropylene (PP) compound is being used to produce the door panels of Italian commercial utility vehicle producer IVECO's new Eurocargo truck model. LyondellBasell's new Softell PP compound was selected for the new Eurocargo model to create a comfortable, "feel-good" atmosphere increasingly required in commercial utility vehicle interiors. "The door panels produced using our Softell compound not only have warm, soft-to-the-touch qualities, but they also match the surrounding surfaces from an aesthetics standpoint, and provide excellent finish and color consistency," said Christoph Sondern, Vice President of LyondellBasell's Automotive Business in Europe. The finished part was styled by Iveco and designed by Italian supplier Plastal S.p.A., which developed the technological aspects of the application from inception to production. Compared to competitive interior solutions such as painted ABS, Softell PP compounds offer additional advantages for automotive interiors, including excellent processability and high quality design potential. Softell compounds are used to produce injection molded finished parts in one step, using one material -- with a sophisticated property profile and high serviceability, but without coating material waste. A door module measuring 1.20m high and 0.80m wide can be produced using a monomaterial concept that significantly reduces processing steps. "Up to 40 percent cost savings over conventional systems are possible," said Sondern. Softell compounds also offer safety benefits. Due to their morphological structure, finished parts produced using Softell compounds do not form sharp edges and splinters in crash tests, even at low temperatures. In addition to safety and design freedom, Softell compounds also surpass conventional PP compounds in terms of scratch resistance and low levels of gloss. With Softell compounds, light weight, cost effective door panels and many other interior components can be produced without compromising part performance. "Softell resins represent an entirely new class of plastics that enable the production of parts with high quality surfaces and outstanding finished part properties," said Erik Licht, Global Marketing Manager for LyondellBasell's Softell compounds. "All of this is achieved using an all-polyolefinic material in a simple injection molding process that provides a cost competitive alternative which offers resource efficiencies and minimizes environmental impact," said Licht. Eurocargo's door panels produced using Softell compounds also provide very good acoustic characteristics. "Tests show that door panels produced with the resin showed better sound and vibration absorption properties compared to ABS and ABS/PC blends," added Licht. "This contributes to reduced passenger cabin noise and a more pleasant riding experience." "Since we commercialized our Softell range for automotive applications earlier this year, we are seeing significant interest from manufacturers, as the resins meet stringent specifications of several European automotive interior applications," said Sondern. The Eurocargo is one of the most successful mid-weight commercial utility trucks and is designed to guarantee complete operator satisfaction, particularly in terms of reliability and productivity. As a vehicle, it is adaptable to any type of application or operation, thanks to a modular design structure that ensures all-round versatility without compromising design integrity.